Hall of Famer Rod Carew... Originally signed by Angels scout Roman Ocumarez. Entered 2018 ranked by Baseball America as #6 prospect in Angels organization and the top pitching exclusive prospect (RHP/DH Shohei Ohtani was ranked #1)...Ranked #7 by MLB.com in the Halos system... After opening season with Triple-A Salt Lake, made Major League debut with Angels April 11 at Texas and earned win after tossing five innings and allowing one run on one hit (HR by Ryan Rua)...At 21 years, 267 days, was youngest A.L. pitcher to earn a win during 2018 season...Became youngest Angels player to make his Major League debut since Mike Trout (19 years, 335 days), July 8, 2011... Ranked third among American League rookies in wins, innings pitched, ERA (min. 75 IP) and batting average againstcFirst Angels pitcher to record 10+ wins in his debut season since Jose Arredondo (10 wins in 2008)... Pitched to a 2.47 ERA (62 IP . 17 ER) on the road, which ranked fourth in American League (min. 50 IP)... Was first Angels rookie to make 26+ starts in a season since Scott Schoeneweis (27) in 2000... Carried no-hitter through first 5.1 innings of start on May 3 vs. Baltimore before allowing a single to Trey Mancini... Set career high with 12 consecutive scoreless innings pitched between Aug. 31 . Sept. 10... During start on April 22 vs. San Francisco, tossed 49 pitches in a scoreless first inning, including a Major League record 21-pitch at-bat vs. Brandon Belt (previous record was 20 pitches seen by Houstonfs Ricky Gutierrez vs. Cleveland RHP Bartolo Colon on June 26, 1998). Entered the year ranked by Baseball America as #10 prospect in Angels organization ... Opened season with Adv.-A Inland Empire and pitched to a 2.48 ERA (65.1 IP - 18 ER) with 57 strikeouts and a .202 batting average against (48/238) in 11 starts for 66ers ... In month of May, went 3-1 with a 1.86 ERA (38.2 IP - 8 ER) with 34 strikeouts and seven walks in six starts for Inland Empire...Was named Angels Organizational Player of the Month ... At time of promotion to Double-A Mobile, June 1, ranked fourth in the California League in ERA, sixth in strikeouts and third in batting average against ... In first month with BayBears, was 1-1 with a 0.76 ERA (23.2 IP - 2 ER) with 19 strikeouts and three walks across four starts to earn second consecutive Angels Organizational Player of the Month honors ... Promoted to Triple-A Salt Lake, Aug. 22...Did not allow an earned run in two of three starts for Bees ... Named the #6 prospect in the Angels' organization by Baseball America for the 2018 season. 15 de abril de 2019 Los Angeles Angels llamado RHP Jaime Barria de Salt Lake Bees. 11 de abril de 2019 Los Angeles Angels opcionado RHP Jaime Barria para Salt Lake Bees. 10 de abril de 2019 Los Angeles Angels llamado Jaime Barria de Salt Lake Bees. 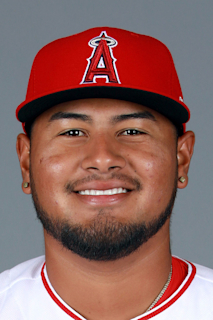 27 de marzo de 2019 Los Angeles Angels opcionado RHP Jaime Barria para Salt Lake Bees. 23 de julio de 2018 Los Angeles Angels llamado Jaime Barria de Inland Empire 66ers. 12 de julio de 2018 Los Angeles Angels opcionado RHP Jaime Barria para Inland Empire 66ers. 12 de junio de 2018 Los Angeles Angels llamado Jaime Barria de Salt Lake Bees. 2 de junio de 2018 Los Angeles Angels opcionado RHP Jaime Barria para Salt Lake Bees. 26 de mayo de 2018 Los Angeles Angels llamado Jaime Barria de Salt Lake Bees. 16 de mayo de 2018 Los Angeles Angels opcionado RHP Jaime Barria para Salt Lake Bees. 3 de mayo de 2018 Los Angeles Angels llamado Jaime Barria de Salt Lake Bees. 23 de abril de 2018 Los Angeles Angels opcionado RHP Jaime Barria para Salt Lake Bees. 22 de abril de 2018 Los Angeles Angels llamado Jaime Barria de Salt Lake Bees. 12 de abril de 2018 Los Angeles Angels opcionado RHP Jaime Barria para Salt Lake Bees. 11 de abril de 2018 Los Angeles Angels llamado Jaime Barria de Salt Lake Bees. 10 de marzo de 2018 Los Angeles Angels opcionado RHP Jaime Barria para Salt Lake Bees. 20 de noviembre de 2017 Los Angeles Angels seleccionado el contrato de Jaime Barria de Salt Lake Bees. 22 de agosto de 2017 RHP Jaime Barria asignado a Salt Lake Bees de Mobile BayBears. 4 de junio de 2017 RHP Jaime Barria asignado a Mobile BayBears de Inland Empire 66ers. 5 de abril de 2017 RHP Jaime Barria asignado a Inland Empire 66ers de Burlington Bees. 7 de septiembre de 2016 Burlington Bees activan a RHP Jaime Barria de la 7-d&iacute;a lista de deshabilitado. 1 de septiembre de 2016 Burlington Bees ponen a RHP Jaime Barria on the 7-d&iacute;a lista de deshabilitado. 2 de abril de 2016 RHP Jaime Barria asignado a Burlington Bees de Orem Owlz. 30 de julio de 2015 RHP Jaime Barria asignado a Orem Owlz de AZL Angels. 20 de junio de 2015 RHP Jaime Barria asignado a AZL Angels. 11 de abril de 2013 Los Angeles Angels agente libre firmado RHP Jaime Barria con un contrato de la ligas menores.